I love reading. I’ve always been a bookworm and, although I don’t have the time I used to, I still read quite a bit. I actually find myself reading more nonfiction than fiction, but I love a good fiction book as well. Recently though, I read a financial book that’s stuck in my head… and I’m not sure whether that’s a good or bad thing, but it made me question my retirement funds. The book I finished reading is The 3 Simple Rules of Investing: Why Everything You’ve Heard about Investing Is Wrong and What to Do Instead by Michael Edesess, Kwok L. Tsui, Carol Fabbri, and George Peacock. First off, please note that I was not asked to review this book or paid in any way (the link to it is an Amazon affiliate link though). I’ve read a lot of financial and investment books – some tell you to do this and some tell you to do that. Regardless, they all seem to have a pretty consistent in what they’re preaching. This one, however, went down a whole different path… and that’s why it keeps messing around with my mind. The gist of it is that most of what Wall Street and financial advisors tell you is a big old fat fib. Now, if you’ve been reading my posts, you know I already think the stock market is a Ponzi scheme that we’re stuck with, so that did help to hook me somewhat. 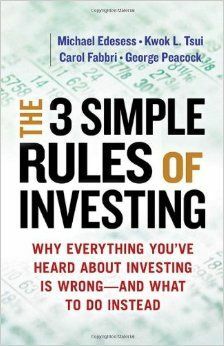 Part 1 of the book comes right out and tells you their 3 simple rules of investing. Part 2 then proceeds to tell you about the temptations that financial industry will confuse you with and why it’s not correct information. I’m normally pretty skeptical when it comes to advise books, but most of the information in the book seemed to be common sense and backed up with numbers. There were a lot of different points in the book, but the authors spent a fair amount of time discussing the problems with managed funds. Based on that as well as what I’ve seen elsewhere, I decided to change my choices of funds in my 401(k) plan. In a nutshell, I basically moved everything over to index funds. And here’s why… the fees you pay over the years for managed funds is ridiculous. To give you an idea, about a year ago, I had already made changes to my 401(k) to funds with lower expenses. However, according to Personal Capital’s free Retirement Fee Analyzer, even though I had my fees down to 0.81%, my total fees were still projected to be over $65k!! And that’s with the assumption that I’ll be retiring in less than 10 years!! The idea behind these managed funds is that there are fund managers that sit there and analyze and figure out (mostly computer analysis) what the best stocks are for your mutual fund to be invested in. So by that logic, the funds should do much better than the non-managed funds such as index funds. According to this book, however, that’s not necessarily true. In fact, the authors say that index funds do pretty much just as well as the managed funds and sometimes even better. If you’re unfamiliar with an index fund, it’s basically a mutual fund that’s setup to follow a stock market index (such as the S&P 500). In other words, an index fund will basically follow the highs and lows of the index it follows. Because of this, there’s really not a lot of “management” so the fees are generally a lot less. Now, before I tell you about the changes we made in our 401(k) plans, I do want to take a second to vent at how much it ticks me off that they hide the fees of each fund. And I’m sure this on purpose… the company that holds your funds makes more money on the managed funds and, even though they’re now required to provide this information, they still don’t want to make it that easy to find. In every table on both my broker’s website as well my wife’s, you can easily see the investment, the asset class it belongs to, etc., but the fees are nowhere to be found. To find those, you need to dig into each prospectus individually… jerks. Regardless, eventually I got everything sorted into a spreadsheet so I could compare things a little better. My goal was to move the bulk of my 401(k) to a domestic index fund (maybe 1/2 to 2/3) and then most of the rest into an international index fund. Even though my company finally just added a domestic index fund, they didn’t have any other index funds. But, as luck would have it, there was also a new Vanguard target retirement fund that was along the lines of what I was after. It’s roughly 55% US stocks, 35% international stocks, and 10% bonds. Most importantly, it has an expense ratio of just 0.18%. 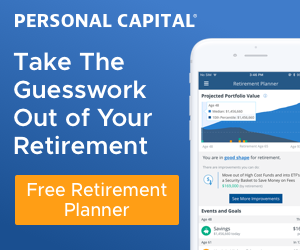 After I moved my 14 funds into this 1 fund, I re-ran the Personal Capital fee analyzer and it projected my fees to be a little over $12,000… still a ridiculous amount of money to have to give away, but much better than the $65,000 that was originally projected. I then made similar changes on my wife’s account and moved her from 9 funds with an average of a 0.96% expense ratio to a single index fund with a 0.88% ratio. Although still an expensive expense ration and not a huge drop, it’s the best her plan offers. But every dollar counts so it’s something. I’m starting to invest more of my Roth IRA into dividend stocks because I’m excited about the passive income they provide. However, since my hands are tied on our 401(k) plans, I’m feeling a little better about doing the best I can with what’s available. The match I get from my employer on my 401(k) doesn’t have a cap, so I can’t leave that money on the table and max it out. I’m hoping some of you out there have read The 3 Simple Rules of Investing book and have some thoughts on it or might give it a read and let me know your reaction. Other than that, are most of the funds you invest in managed or index funds? Index funds are a great choice. That is what I have most of my investments in. It is a great way to be in the market and I think will dissipate your sense of it being a ponzi scheme. Thanks, Jason – I still have that unsettling feeling of depending so much on the market, but that’s why I’m working other avenues as well (real estate, this website, writing books, etc.). It is hard to beat index funds based on their low expenses, tax efficiency in taxable accounts, and their ability to capture market returns. We are are fortunate to have vanguard and fidelity index funds in our 403b accounts. We have about 96% of our money invested in index funds. Very true, Dave – that’s fantastic that you guys have some good choices in your 403(b)s. I was excited about having even one Vanguard fund to choose from, but I wish my wife had some better choices in her account.